Details of the move to Free to Play. Defiance is moving from a Buy to Play model to a Free to Play model. This means that new players will no longer have to purchase the game in order to play it. PC players have already had the transition to Free to Play on PC June 4 and is expected to go Free to Play on consoles July 15 (PS3 and XBOX 360). All people who have previously purchased the game will receive benefits. All DLCs will remain purchasable. The Free to Play release also comes with a patch to alter several game systems and fix bugs. No-one will lose character slots, loadout slots or inventory slots if they already have them in use. Even if the inventory slots are above the maximum 300 you they will retain what they have purchased. Consoles will turn Free to Play a month after PC, but all platforms will receive the 1.6 Patch at the same time. All trial members will be upgraded to free to play members without additional benefits. This applies to PC only as there was no trial on consoles. Note: Any slots purchased will be retained and will not need to be claimed again. Even if the previous total of inventory slots exceed 400 they will be kept. 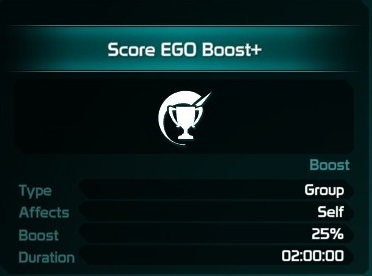 PC: Your first login after June 4th. Consoles: Your first login after we go F2P (July 15th). 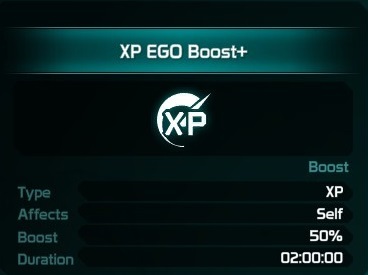 Personal Plus Boosts – These are improved versions of the current personal boosts which will stack with the original boosts. 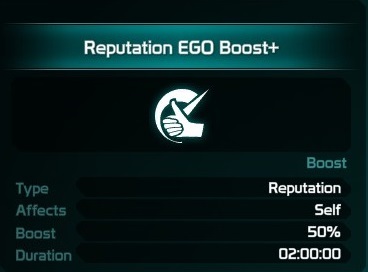 These will be available for Scrip, Salvage, Reputation, Score, XP, and Skill. 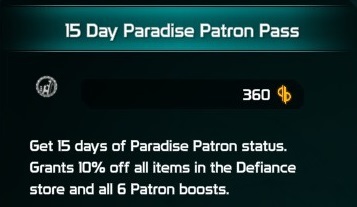 Patron Pass holders will receive one of these in their Paradise Patron Weekly Supplies chest. 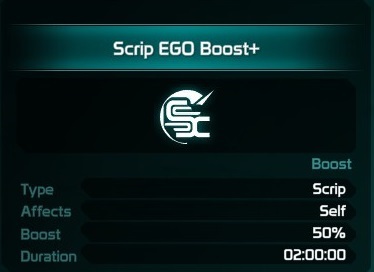 The Patron Pass will provide a boost to Scrip, Salvage, Score, Reputation, XP, and Skill. 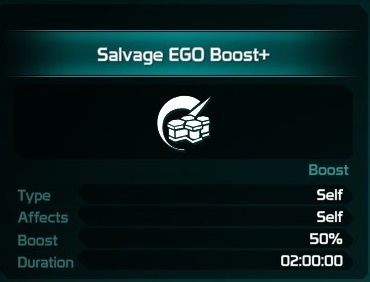 This will stack with all other boosts. 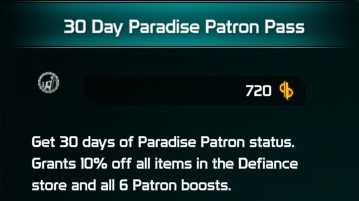 The Patron Pass will provide a 10% discount on all Defiance Store purchases and provide Paradise Patron Daily Supplies and Paradise Patron Weekly Supplies lockboxes. 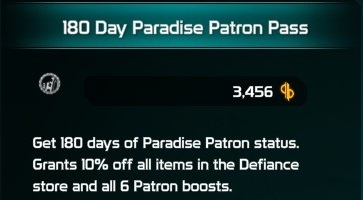 All players who have purchased the full game before the conversion to Free to Play will receive 30 Days of Patron Pass. Ark Keycode capacity upgrades will allow you to purchase up to a capacity of 125 keycodes. All players will start with 50, and Full Game Players will have to claim back the +25. 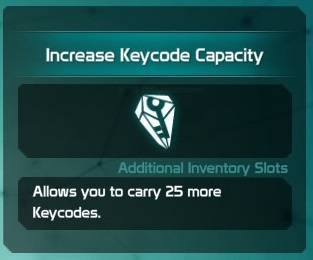 Incrase Keycode Capacity unlocks are sold on the Defiance store up +25 at a time up to a total maximum of 125 for 400 Bits per upgrade. 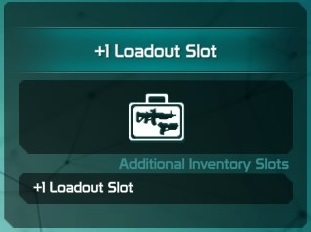 Loadout Slots will be available for to a max of 6. All players will start with 2, including Full Game Players they will have to claim back the loadout slots from the Claims Section. 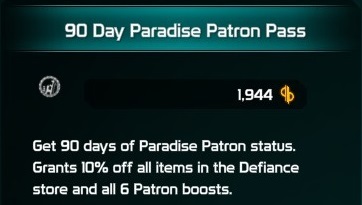 Loadout slots are sold in the Defiance Store for 240 Bits per slot. i played this game when it first came out and then i had to stop playing for a while for unavoidable reasons and now i started back up and im into it again and is still fun and a great game. i have a question though i paid for every thing that i have but i didnt have to pay when i first started playing is this free to play gonna have an affect on me or am i considered " old school " as i seen on the title it was gonna give people that werent free trial or that had first started. If you were a free trial before the move to F2P, you'll be a full member now. If you purchased the game before F2P, you'll be a full member still with a few added extras. 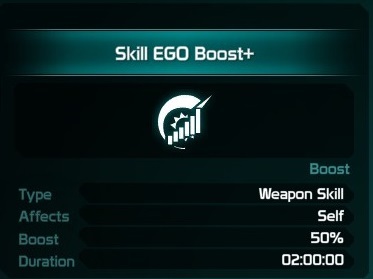 ......so I guess I'm coming back when this goes to F2P. Turns out the game wasn't screwing with my connection.